I’ve seen this a couple of times with various applications, I don’t know it ifs a Windows problem, or simply the code in the application that faults, anyway it affected mRemote which I use on a daily basis, so I needed to fix it (Note: I’ve seen this on Java based applications as well). 1. 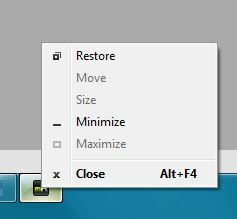 While holding the “Shift” key, right click the minimized applications task bar icon. (This brings up the OLD Style windows properties).